The Apple Finance Board is home to some of the best known and hardest working independent AAPL analysts on the planet. As a service to the members of the AFB, a popular and well respected discussion board, I'm hosting the index of AFB AAPL price targets and share price forecasts developed by the members here at Posts At Eventide. 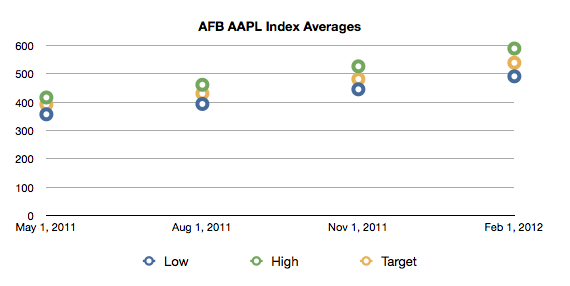 This post is an update to the initial AFB AAPL Price Target Index published in January. The participants in this index represent a cross section of AFB members ranging from well known AAPL analysts Horace Dediu, Daniel Tello, Turley Muller and Andy M. Zaky, to long-time AFB members Mark Beauch and Ron Smith and newer members such as Dennis Hildebrand. In all, twenty four (24) members of the Apple Finance Board are represented in the index. Index participants submitted AAPL price targets for the first day of the month following the release of Apple's quarterly earnings reports through February 1, 2012 and submitted associated ranges for the share price. Comments on the index can be made at the bottom of this post and for registered members of the AFB in the topic created specifically for this discussion. Thank you to the index participants for submitting their share price targets and anticipated trading ranges. 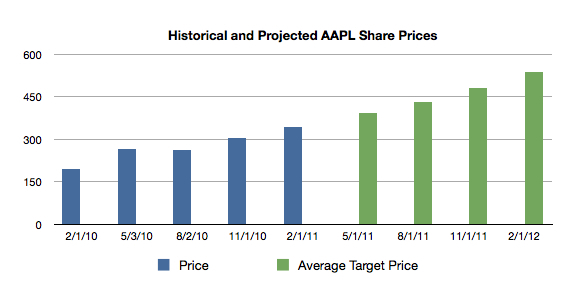 The graph and data table below indicate the average AAPL price targets of the two dozen index participants. As a group the twenty four AFB members participating in the index expect Apple's share price to reach $539 per share on or before February 1, 2012, representing a roughly 56% advance in the share from the closing price on February 1, 2011. The graph and table data below depict Apple's share price trend over the past year and the average target prices from the index participants for the next 12 months. These dudes are insane with their high Apple price targets. $400 a share by May is ridiculous. Netflix will probably reach $400 before Apple does. It doesn't matter how many iDevices Apple sells, there's no guarantee at all that the share price will rise very much. Apple will have a huge cash reserve but that's about it. No individual investors are buying Apple stock and the hedge funds which hold 70% of Apple shares are tightly controlling Apple share movement from skyrocketing. 35 to 40 is not that big a move. Apple grew eps in its most recent fiscal year at about a 67% pace and followed up that performance with a 75% rise in eps in the December quarter. A rise from today's closing price to $400 per share by May 1 would track with the anticipated rise in trailing 12-month earnings following the release of March quarter results around the third week of April. Since the heart-stopping drop in $AAPL last week, have there been any revisions to these price target indexes? There have been no updates to this price target index. The May 1st target price is less than 15% above today's closing price and the revised 12-month trailing earnings following the March quarter results will most likely move forward by at least 15%. I'm not expecting p/e compression following the release of the March quarter results. I know this question was asked just above my post, but I thought I'd ask a second time since the news of the Nasdaq reweighting came out. I've read that many funds would need to sell off their $AAPL shares to comply with the new reweighting, which is to occur May 2nd. I've read a variety of opinions, that most of the selling would be done on May 2nd, that the selling would continue for months, etc. Does the reweighting have any impact to the price target indexes? Is most of the AFB still expecting 380-390ish by May 1st? Thanks again. If share price is dominantly affected by earnings, how do we explain the relative flat prices in AAPL shares so far this year (2011), given the blow-out earnings in January and (hopefully) April? Zaky talks about compression of P/E.....is this the key? ?